This is a region-free DVD-R without case or artwork. In Greek with English subtitles. 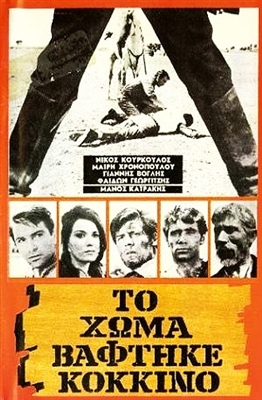 The original Greek title of this film is To Homa Vaftike Kokkino. One of the hallmarks of Greek cinema. In 1907, in the parts of Greece that are liberated, not all Greeks feel free and the biggest ranges of the Thessalian valley are owned by a few large landowners. The farmers who are forced to work like slaves find, in Marinos (Notis Peryalis), a well educated young man and their ideal representative. Odysseus (Nikos Kourkoulos), son of one of the landowners, supports Marinos and conflicts with his own father and brother, a conflict that will have tragic consequences. All your services are great and excellent and very honest. One of the best companies I ever dealt with. Hope you all the progress specially with french and Italian films.. Hopefully westerns films or spaghetti westerns will be available by your company in the future. Another Oscar-nominated movie, Best Foreign-Language Film, absent a commercial VHS or DVD. So MovieDetective's DVD-R release is quite welcome. I'm working backwards on a hobby of watching at least 50 movies per year of release, and second-guessing the Oscars. My 1966 alternative pick for supporting actress being Mary Chronopolou from this movie. Copyright © 2007 www.moviedetective.net. All Rights Reserved.